Where to Stay In & Near Bryce Canyon N.P. Late spring and summer are the busiest time in Bryce. There is one lodge and two campgrounds in the park, a section of one of these campgrounds is open year-round. Outside the park, we hate to come down on a place, but if you can’t score a room or campsite inside Bryce Canyon, it’s worth the fifty-mile drive to Escalante over Bryce Canyon City, the “town” right outside the park’s entrance. Bryce Canyon City is touristy and overpriced, and the best food in town is Subway. Escalante overflows with personality and charm. If you have to do Bryce Canyon City though, there is a hotel there. North Campground. Tucked into the Ponderosa pine forest across from the park’s visitor center, the North Campground has 99 sites, which includes 13 RV-only sites. Reservations for RV-only sites can be made in advance. The 86 other sites are tent or RV and first come first served. Between May and September, these sites are usually full by noon. There are no RV hooks-ups here, but there is a fee-for-dump station ($5) at the south end of the campground. 99 sites, 13 are RV only, $; or 877/444-6777. Sunset Campground. Near Bryce Canyon Lodge and the lookout it’s named after, Sunset Campground is the closest camping to the Bryce Amphitheater. Sunset Point is a short walk. There are 100 sites here, all scattered beneath large Ponderosa pines. Twenty of the sites are tent-only and available to reserve in advance. The remaining 80 sites are tent or RV and first come first served. Between May and September, these 80 sites are often full by early afternoon. 100 sites, 20 are tent only, $; or 877/444-6777. The Lodge at Bryce Canyon. Designed by Gilbert Stanley Underwood, the lodge, which opened in 1925 and has been recently redone, is a National Historic Landmark. Only the 35 Sunset lodge rooms are open in winter. The season for the rest of the rooms is from the end of March through the middle of November. The 114 rooms at the lodge include historic lodge suites, western cabins, and newer motel rooms, $$$; or 877/386-4383. Best Western Plus Ruby’s Inn. The Syrett Family has been hosting guests to Bryce for over 100 years. The fourth and fifth generations now manage the hotel, which has a massive river rock fireplace, taxidermied animals and overstuffed leather furniture, in the lobby. $$-$$$; 26 S. Main; or 866/866/6616. Shooting Star RV Resort. Choose from eight Hollywood-themed Airstreams—each with a private bath and fully equipped kitchen and also air conditioned—camp or park your RV at this friendly, funky spot that shows outdoor movies some nights. It’s a five-minute drive into Escalante, but we love The Kid’s Hideout, a 23-foot Airstream decorated like Robert Redford’s during the shooting of Butch Cassidy and the Sundance Kid. $-$$; 202 W. Highway 12; or 435/826-4440. Circle D Motel. Simple, clean and budget-friendly motel with 22 rooms in downtown Escalante. $-$$; 475 W. Main; or 435-826-4297. Wild West Retreat. The historic pole barn—converted into a private cabin—and renovated 1920s cabin at Wild West Retreat feel remote, but they’re walking distance to the center of town. $$; 269 S. 200 East; or 866/292-3043. Canyons Bed & Breakfast. You might book for the location—on Escalante’s Main Street—but you’ll most love the gardens, expansive lawns and orchard here. 4 rooms, $$$; 120 E. Main; or 435/826-4747. Boulder Singing Earth Farm. This working organic farm hosts guests in a modern version of a traditional Mongolian yurt, complete with a wood burning stove. For campers, there are several tent sites and you have access to a covered ramada for cooking and a full bathroom. $; 4580 W. Hell’s Backbone Rd. ; or 435/335/7485. Boulder Mountain Lodge. 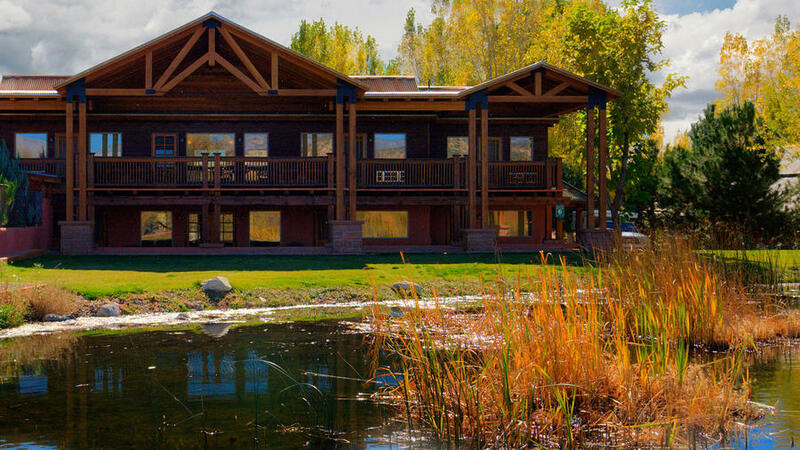 Rooms at this luxury lodge are on a lake and the 11-acre property itself is a bird sanctuary. $$-$$$$; Jct. of Highway 12 and Burr Trail; or 435/335/7460.